TOKYO (AFP) - Police in Japan said on Monday they want to charge 10 drivers over a US$4 million (S$5 million), multi-car pileup involving eight Ferraris, one Lamborghini and a Mercedes-Benz. 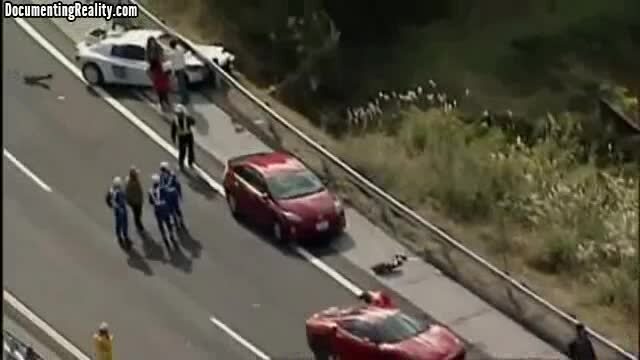 The chain-reaction smash in December 2011 occurred when a convoy of expensive sports cars were on a freeway in Shimonoseki in western Japan, said Yamaguchi prefectural police official Shinji Tanaka. The driver of the lead Ferrari lost control of his luxury ride and those behind the wheels of nine supercars and three other vehicles failed to apply their brakes in time. One car driving on the opposite carriageway was also affected. Imagine the price to just maintain those vehicles. Just to fix the brakes costs as much as a mercedes. And this is why IF you buy one of these cars you should be made to take advanced road driving lessons and tests. Its like having a 9mm most of your life and then being given an M16 or Ak47. Big difference, no training.